Sciatica? Or Is It Low Back or Leg Pain? LBP or low back pain can be contained or localized to only the low back area. It can also radiate pain down the leg. This distinction is very essential as the former, low back pain only, is usually less complicated and carries a more favorable prognosis for complete recovery. This article will talk about the different types of leg pain, which occur with different conditions of LBP. 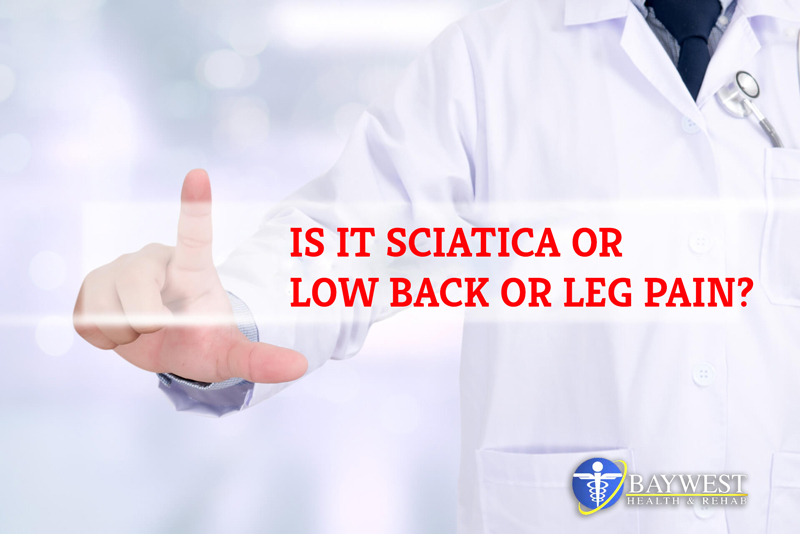 All of us have heard of the word “sciatica”, which is often loosely used to describe everything from the muscles of the low back, from the sacroiliac joint, from LBP arising from the joints in the back, and even from a pinched nerve, which is caused by a ruptured disk. The term “sciatica” should only be considered when sciatic nerve is pinched. The sciatic nerve consists of 5 smaller nerves (L4, L5, S1, S2, S3), which arise from the spine and then come together to form one large nerve, referred to as the sciatic nerve. Sciatica occurs when the sciatic nerve or any of the small nerves (L4 – S3) becomes irritated or compressed. This can (and always is) as a result of a lumbar disk herniation, a tumor around or near the nerve, pressure from an arthritic spur off the spine where the nerve exits, or a mis-positioned vertebra. A term referred to as “pseudosciatica” consists of a pinch from the piriformis muscle where the nerve passes through the pelvis (in the buttocks or cheek), which, in most cases, have been referred to as “wallet sciatica” because sitting on the wallet in the back pocket is always the cause. Other pseudosciatic causes are referred pain from the joints, which patients describe as a deep ache inside the leg or from a metabolic condition where the nerve is affected by diabetes and other conditions. The term neuropathy is best label when alcohol toxicity, hypothyroid, diabetes, lead poisoning, and/or another cause is the culprit. Direct trauma such as hitting the nerve during injection into the buttocks or a bruise to the buttocks from falling can also lead to sciatica. Symptoms associated with sciatic are numbness-tingling, low back pain, back of the calf, thigh, and/or foot pain, and buttock pains. Muscle weakness can occur if the nerve is compressed enough, and this makes it hard to stand up on the tip toes, thereby, leading to a limp when walking. Your doctor may raise your straightened leg and if there’s a pinched nerve, sharp pain can occur as the nerve is stretched. If pain occurs anywhere between thirty and seventy of elevation of either side of the opposite leg and/or same side leg, this encompasses a positive test for sciatica. When a disk is herniated into nerve, bending the spine backwards can move the disk away and off the nerve, leading to relief that is very diagnostic of a herniated disk. The doctor can also have a clue about nerve damage by having patients walking on their toes and then heels as well as watching for foot drops and testing the sensation with sharp objects and reflexes at the knee and Achilles tendon. The good news is, chiropractic techniques can help resolve this complication, and this helps you avoid unnecessary surgery. Therefore, be sure to consult with your chiropractic doctor first before you go for surgery.